Employee Carlos Rodriguez takes his fitness to the extreme! Extreme fitness comes naturally to Carlos Rodriguez. 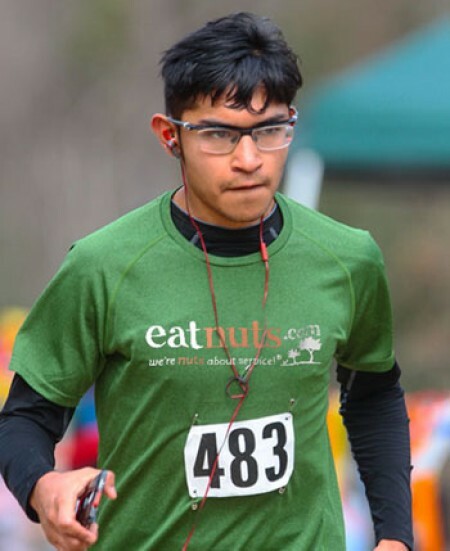 As an employee at Eatnuts.com, Carlos sponsored us by running the 100mi Rocky Raccoon Ultra Marathon. And at the age of 19, Carlos was the youngest runner to complete the 100mi Rocky Raccoon Ultra Marathon this year. How did he get into this challenge? Carlos was invited to participate after placing 2nd in a 50 miles race, the Cactus Rose Race, in October of 2014. When Eatnuts caught wind of Carlos’s extraordinary story, we immediately encouraged him to sponsor us in this 100 mile Marathon. And we were so proud that he did! This could be the beginning of many more marathons for Carlos in the future. The Rocky Raccoon is an ultra marathon race. Not everyone participate and not everyone will qualify. Invitations are required. Even at his young age, it was an honor for Carlos just to be invited. So how does a kid just graduating high school receive an invitation of this nature you must ask? Carlos has been running since the age of 8, following the footsteps of his uncle. When Carlos ran in middle school he was running at the high school level. By the time he was in high school he was running at the college level. He says, "Running has been a part of my everyday life for a long time. Just like brushing my teeth and eating, I run. After Carlos gets off work around 6 or 7 pm he immediately gets his running shoes on and runs. When he is not running he gets anxious and his feet get ticklish. If he doesn't run for a week, which is not often, Carlos says he gets tired and lazy in other areas of life. He doesn't know what he would do if he were not able to run. To prepare for this race, Carlos trained by running 25 miles a day, seven days a week which would take him about 4 hours. In preparing and participating for this race, he went from 120 lbs to 99 lbs and is now focused on gaining back some weight and restoring his body by maintaining a healthful diet and not running excessively for an entire month. Carlos finished the race within 22 hours and says he would do things a little differently next time. He didn't know what he was taking on when he accepted the invitation to run in the race. At 80 miles his vision began to blur. He wasn't sure he would make it. Since the race, as new challenges and problems come his way, he focuses on the reward at the end. He sees himself now as able to get through anything. It elevated his confidence and the way he views challenges. Now as challenges present themselves, Carlos sees them as opportunities rather than something to avoid. Although he doesn't see himself becoming a professional 100mi race runner or ultra marathon runner, he would like to run more in the future. This experience has changed his life. He is also not opposed to taking on another 100 mi race in the future. Maybe another invitation is headed his way! At Eatnuts.com, we're fanatical about eating healthy and staying fit. We want you to be too! Let us know what you think about Carlos’ achievement!